While StarCraft II multiplayer may be the long-term draw of Blizzard's highly anticipated real-time strategy sequel, the game's single-player campaign is also packed with depth and replayability. That's due, in part, to the game's technology upgrade system. StarCraft II: Wings of Liberty's campaign mode features units and buildings that players won't be able to use in multiplayer. That includes Terran forces like the Medic and Firebat, yanked from multiplayer. It also includes brand new tech and structures, like Juggernaut Plating for the Marauder and the Bunker's mounted gun, the Shrike Turret. Read on for a list of what we saw at Blizzard, with a little hands-on impressions of these single-player only upgrades. We only made it through two of the seven columns of upgrades, which also include tweaks for Vehicles, Starships, Mid-tech, Ghost/Spectre and Dominion units. There are two upgrades per unit—with the exception of things like the flamethrowing Perdition Turret—one of the two purchasable items is simply the existence of the defense structure itself. Here are details on the Infantry and Base upgrades. We only got a chance to experiment with some of these upgrades. But Blizzard reps were quick to recommend the Micro-fusion Reactor for the mineral-collecting SCVs, which makes the farming units almost one-third cheaper. We opted for the Perdition Turrets and Shrike Turrets, very useful while doing much of the base defense we did during the campaign. 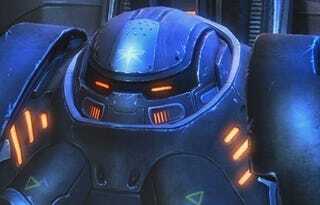 Similarly, having permanently researched Stimpacks and health upgrades for the Marine quickly felt indispensable. But each upgrade felt good when we got it. We're looking forward to seeing what else Blizzard has in store for tech upgrades in single-player, but feel like that information will be a long time coming.